Neurosis playing live at Brooklyn Masonic Temple on January 19, 2013. After the break: Pharmakon at Home Sweet Home and Theologian at Saint Vitus. Like Zora Neale Hurston, Katherine Dunham won a Guggenheim to study culture of the African diaspora in Haiti and elsewhere. Like Maya Deren, who was once Dunham's secretary, the pioneering choreographer traveled to the field and produced an historic recording of music and ritual in the field. (Maya Deren's Voices of Haiti was shared right here in Motherlode #165.) Our lead item today presents Dunham's miraculous 1956 recordings of Haitian, Cuban and Brazilian drums and song. The LP features a crew of legendary percussionists including Francisco Aguabella, Julito Collazo and Albert Laguerre, who all traveled back the U.S. and toured with Dunham's dancers. Check out all five of the wonderful recordings here, but be sure to grab this groundbreaking document. If we’re very, very lucky -- and I’m talking here about the kind of luck that would get you rudely expelled from even the highest-class Las Vegas casino -- the star Betelgeuse, located 640 light years away from us in the top-left corner of the constellation Orion, will die within our lifetimes. Betelgeuse is much larger than our sun, which means that its lifespan is correspondingly shorter. Its death throes will manifest in a supernova -- a stellar explosion of such magnitude that it will put out apocalyptic amounts of light and energy. Stars operate on eonic timelines, so Betelgeuse could erupt in the next ten seconds, or the next hundred thousand years. If our luck holds, we’ll see it almost as a second sun -- it’ll rival the moon in the night sky. We’ll be able to read by its light. For a few brief months, Betelgeuse will put on an inspiring show. Most of us will stare at it and see something gorgeous. Others will be quietly terrified -- the heavens rarely speak unless to say something, and nothing good can come of a message sent through the death of another solar system. Still others will marvel for a day, until the wonder of the thing recedes into banality, long before the star itself dims. For at least one person -- and I don’t yet know who that is, but I’ll near-guarantee he or she exists -- the supernova won’t be inspiring, or terrifying, or banal. It’ll be an excuse. Time to go. Time for everyone to go. Beloved anarchist Emma Goldman famously chirped, "If I can't dance, I don't want to be in your revolution." No cause is worth denial of joy, she insisted. From the fife and drum troops of the Continental Army, to the populist warblings of Woody Guthrie, to the Boss rocking the presidential stump, music has contributed to social and political upheaval throughout history. Take the Civil Rights movement for example, which was so awash in song as to have its own virtual soundtrack. But not all such music was a joyous affair worthy of Emma Goldman. Particularly the collection of songs reflecting on the most calamitous moment of the era, the assassination of Dr. Martin Luther King, Jr. To acknowledge King's birthday on January 15, I produced this hour-long broadcast for WFMU. Now the Motherlode pays tribute with its own contribution, in the form of our lead item, below. D oes anyone under about 50 years old remember the Fuller Brush Men and Women? How they came door to door peddling not just brushes but all manner of items - many of the same sort of things you might find today in the Vermont Country Store Catalog? My mother loved our Fuller Brush Man - who I remember as an exceptionally friendly, rumpled little man with an immigrant's accent and a love of his job, which he did quite well. She had long wanted to capture his voice and mannerisms on a tape recording. And it happened one September day in 1967. I was seven, and would have started second grade that week, but I was in the last stages of recovering from viral pneumonia, so I was being kept at home. Basically recovered, I was doing what I always did when given the chance - recording my voice, in this case on our brand new Ampex stereo tape recorder. I've faded the tape in as I'm finishing singing a song, and as mom saw the Fuller Brush Man approaching. As you'll hear, she told me to leave the machine running. The conversation took place at the other end of our living room, so the sound quality is not all that great - and will probably be best heard through ear buds - but it's still a prize worth hearing, one that has remained a family treasure. The real action comes in the first half of this four minute clip, and our favorite moment comes early on. After learning that I'm home, recovering from illness, he tells me "Bobby, do you know why I came? I knew that you were out of bubble bath!" Now I ask you, when was the last time that was heard as a sales pitch, from a door-to-door salesman, to the customer's child. When was the last time salesmen came to the home regularly enough to know your children's names and which of your products they used? There is a bit more about the benefits of a good bubble bath ("you smell like a million dollars! "), then I think he does a little bit of simple magic for me with some combs. A conversation about our brand new kitten follows (I think I can make out her cry here and there), and touches on the relationship between our cats, as well as the relative upkeep of cats versus dogs, then the Fuller Brush Man gets to work asking about what products my mother would like. An odd conversation follows - she doesn't want to "buy", and that's fine with him, as long as she wants to "order". I assume she meant that she didn't want anything he had on him at that moment, but will look at the things he can get for her from his catalog. He begins his spiel - the stainless steel sponges are on sale, among other things, and there's a new watch on a chain available. Shortly thereafter, I return to the microphone, comment that I hope the machine recorded him, and go back to recording my own voice again, at which point I've faded the tape. Hoax playing live at The Acheron in Williamsburg, Brooklyn, New York City on January 12, 2013. After the break: Dysrhythmia, Planning for Burial and Wreck & Reference at Saint Vitus. Thurl Ravenscroft: The Story Continues! Just three months ago, I wrote of the end of a 30 year search for an elusive record by Thurl Ravenscroft. With that record added to my collection - the last Thurl 45 that I knew about, but didn't own - I wondered whether there would be any further great Thurl finds - prior to that one, it had been quite a while. The answer fell into my lap barely six weeks later when I stumbled upon another great Thurl 45, one I had never heard of, and which wasn't listed in the tremendous discography at the equally wonderful All Things Thurl website. After enjoying this record mightily for a few weeks, my next move was to share it with the world. 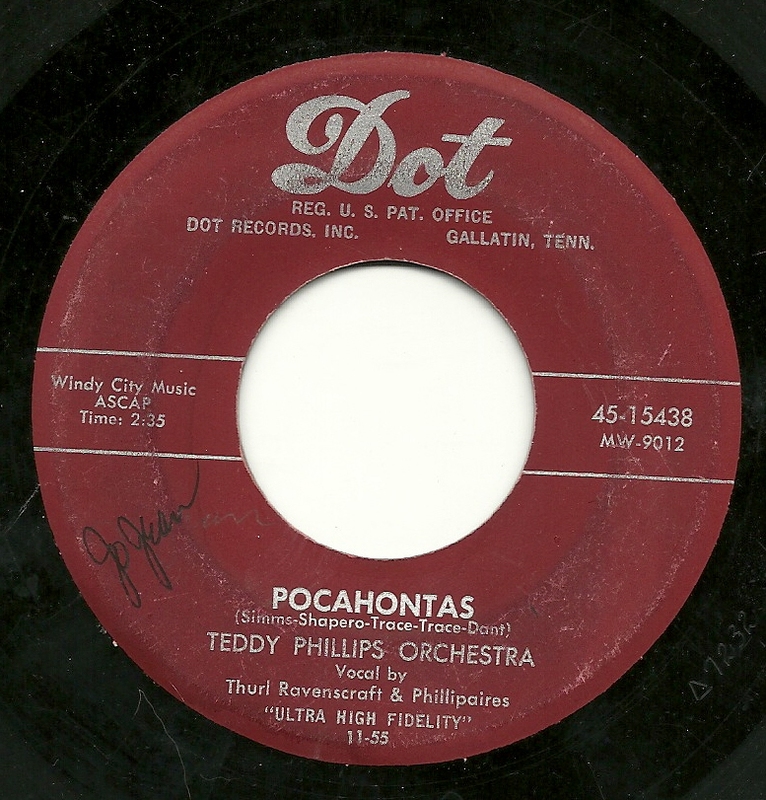 The record is dated November, 1955, and technically, the artist billing is Teddy Phillips Orchestra, vocal by Thurl Ravenscroft & Phillipaires, but the story on each side of the record is primarily Thurl, front and center. Already, I've gone back and forth on which of the two songs I like more. On the A-side Thurl and the gals sing about the thrilling story of "Pocahontas", with a downright goofy chorus built out of the repetition of part of the name of that "Indian maid". 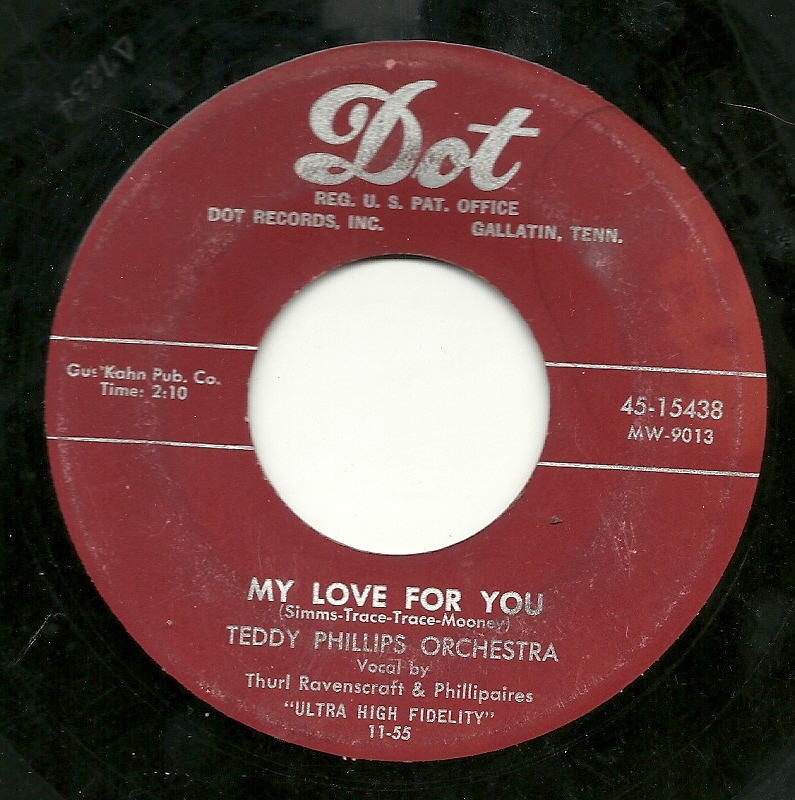 The b-side is a more typical 1950's love ballad, "My Love For You", but Thurl's delivery is great, and there is also a very nice, unusual instrumental section halfway through the record, where individual horns play one note of the melody in succession, sort of like a big band version of The Chordettes. Enjoy! Today we begin our new Comic Book Series at Beware of the Blog with a jazzy little five page yarn ripped from the pages of Black Cat Mystery issue number 46, cover dated October 1953. We'll meet Sam Webb, the owner of radio station WOW, a hard-working but unpopular on-air personality, and join him for one of his last broadcasts. This tender tale was written and drawn by the prolific and unusual Bob Powell (1917 - 67), born Stanley Pulowski, who learned the ropes of the comic book business in the 1940s at the famous Will Eisner studio, over in Tudor City, NY. His work during the period this story comes from was often inked by Howard Nostrand and I suspect that this piece was finished by Nostrand. So settle back in your radio chair and enjoy this slice of broadcasting history - right after the jump. After the break: Magic is Küntmaster at Saint Vitus.